This is a non-scary ghost story! It first appeared in Kings River Life, last year. Enjoy with your family–the little girl? 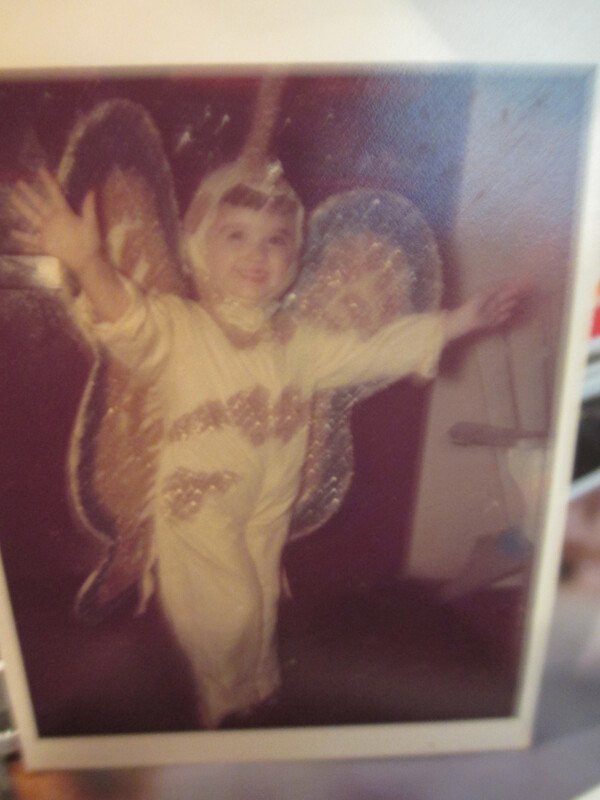 Me at age four in the costume made by my Aunt Claudia. My name is Tirzah. If you’re a student of the Bible you may have heard of me. My sisters, Mahlah, Hoglah, Milcah and I, daughters of Zelophahad, were the first women to be able to inherit property under Mosaic Law. We were always forward and independent thinkers. So why should it be different now, just because we’re dead? While alive, as a wealthy girl, I was sought by many. I married the handsome Zeno. He turned out to be a liar, a cheat, a gambler, a drinker, a wife beater and worse. How could I live with that? Well, to be honest, despite the advice of my sisters, I decided I could live with the constant lies. I lived with the heart- rending knowledge that Zeno often spread his seed with other women. I even paid his gambling debts by selling my share of my mother’s jewelry. I silently endured the many nights when, sloppy with wine, he beat me. What I could not live with was the last thing Zeno did. He murdered me. Looking back on it now, I realize he had planned the crime for some time. Ashamed of the bruises from Zeno’s beatings I usually went alone to the well, in the heat of an afternoon instead of in the morning and late evening with the other village women. One afternoon Zeno followed me. At the very moment I was leaning over the well to pull the bucket up, he hit me over the head with a stick and pushed me in. Only Zeno was there to hear my cry as I tumbled headlong into the water of the narrow well. Just before I hit my head again on the wall of the well and succumbed to eternal sleep, I heard Zeno laughing. In the cool of early evening, before sundown, the other women came to the well. Unable to pull up the stuck bucket, my sister Mahlah looked down and saw my body. When the screams of the women were loud enough to reach my tent, Zeno came running and began to tear his robes and hair. He loudly proclaimed he had been asleep all afternoon and loudly lamented my passing. The other villagers pulled my body out. The Angel of Death and I watched it all from the shade of the nearby palm trees. Shades in the shade. Then the Angel escorted me upward to the Almighty, who in a strong but comforting voice, judged me. “You are to be allowed to join in the joy of My presence for all eternity.” At last, a home I would not have to clean. Feeling suddenly bold, I asked the Almighty for a favor. God refused my request to punish Zeno myself. Usually I could only appear to humans as a face in water but on the day you call Halloween, I could be seen in a full fleshly form. Also, on that one day, I could ask the Lord for special direct intervention. My first case was in my village. A man from another tribe who often stole our water seemed to always escape punishment. With the help of a few camels, I tripped him. He fell into the well where he remained trapped until our village elders found and punished him. Justice. I handled crimes large and small –bullies stealing water jugs, young men pressuring young girls into poor relationship choices, thefts, murders and more, as long as lakes, streams, fountains, wells, aqueducts and Roman baths, wherever or whenever water was connected to the crime. Eventually, I heard about the New World and I came. I arrived in America just in time to deal with Blackbeard, a notorious pirate. One day, he checked his reflection in a pool to see if he was scary looking enough for battle and saw me instead! I yelled “Whoosh!” (I don’t do Boo!) And he was finished. The Governor of Virginia helped. In what’s known as modern times, I thwarted U-boats sneaking across from Germany to North Carolina. Afterwards, I traveled through various cities, finally landing in Pittsburgh, Pennsylvania, a city of three rivers. I put myself in the water system and floated about, at last taking up residence in a golden box. I liked the idea of living in a golden house, an idea I admit I copied from a very bad man, Nero. Actually, my home was a brass box called a water meter. After three thousand years, no water crimes seemed to need me as an instrument of justice, so I began acting as muse to Claudia, the artist who lived in the meter’s house. At midnight, when there were no other sounds, I often whispered color combinations and ideas for new watercolor paintings to her. Anyone else might have thought it was just water gurgling in the old pipes. Claudia knew better. She listened to me. She was never afraid of my noises. After many earth years, my friend Claudia grew ill and moved to a place where nurses cared for her. Claudia’s niece, Jenna, checked on the house weekly. She even stayed overnight occasionally. I decided I liked Jenna as much as I liked Claudia. Around midnight I often called out to her from the pipes, but she slept right through most of my attempts at conversation. One late October midnight when Jenna was NOT there, I heard scuffing, scraping noises. Raccoon? I went back to sleep. A loud bang and the sound of breaking glass fully woke me. I floated up the basement stairs and into the kitchen. Two young men with black cloth on their faces had smashed through the back door of the house. They were stomping around the kitchen. I stayed invisible–just a cold damp presence in the already chilly room. They swept past me and clomped down the stairs carrying a sack. I followed the unsavory pair and watched them unpack hammers, axes and saws. They tore open the walls and exposed the house’s copper piping. They cut the pipes. Water rushed out onto the floor. I fled back into my brass home’s welcoming walls. Then the one called Bert pulled a blowtorch out of his sack. Suddenly a flame was aiming at my home! Fire! I tried to interpose myself between the flame and my box but before I could even bid a proper good bye to the brass home I loved, they had torn it away from the wall and pipes. Water spurted all over the place. I wanted to attack the awful pair, but well, I was simply too horrified to take action. Besides, at that moment, I felt this was a crime against me and in such cases, vengeance or justice is the Lord’s. The duo stripped all the copper piping away and stuffed it and my home into plastic sacks. There was water everywhere in the basement. Then they pulled the bags “bump-a-lump, bump-a-lump” up the steps. I watched as those two awful men dragged the pipes out of the house through the back door, through the yard in back to the street behind and into a waiting truck. I drifted back to the house and suddenly realized (ok so see how fast you are at age 3,000) that the crime was not just against me. It was against Claudia and Jenna and Claudia’s house. I could act! So, having gained back my common sense and sense of purpose, I flitted into one of the open pipes, through the city water system, over to the home of Claudia’s niece Jenna. “Aunt Claudia’s house,” I called to her. She went back to sleep! I kept whispering to her and the next morning, her subconscious, filled with my warning, got her to check on Aunt Claudia’s on her way to work. Jenna heard the whoosh of rushing water as soon as she got to the door. The dear girl called the police and sat down on the front stoop to wait until they arrived. I returned to the basement and noticed one of the thieves had left his saw. In just a few minutes, the police arrived. Two patrol officers exited the car and ran up to Jenna. One was tall and handsome and the other was short and wide. Jenna showed them into the house. The three followed the noise of the rushing water to the basement. Jenna surveyed the scene from halfway down the steps. The fire trucks pulled up in a cacophony of siren noise. Finally, a fireman using a metal detector found the water turnoff point. Then they all went downstairs with Jenna to survey the damage and figure out a bailout strategy. No one noticed the saw in the water in the basement. It started to rain. Handsome checked the back of the house, but found no clues. The firemen recommended a company to pumping out the water and gave Jenna the name of the man in charge of water meters so she could request a new one. Expensive wall and pipe replacement and other repairs would delay the process of selling the home to pay Claudia’s medical bills. I was angry. My poor Claudia and Jenna! I was not willing to accept the verdict of the policemen that these fellows would never be caught. After all, resolving water crimes is my specialty. I floated back down to the basement and hovered over the forgotten saw until I grasped the spirit of the owner. Then I followed the scraps of his disgusting spirit to where he and his partner were selling the stolen copper and my former lovely brass home to their friend Bernie, a salvage yard owner of few scruples (evidently). I heard them tell Bernie they planned to hit a large deserted office building in a place called East Hills the following Tuesday–Halloween Night. Through the pipes and off to the police station, I hurried. It was not hard to find Handsome. I floated up to Handsome’s desk. I checked the calendar on his desk and saw he had night duty on Halloween. I bided my time. Sure enough, he was soon on his way to the men’s room. I plunked myself into the sink but he was in a hurry and the whole time he washed his hands, he simply admired himself in the mirror. Back at his desk, I tried whispering into his ear:”Tuesday, East Hills”. I said it over and over, but he seemed to think my voice was a fly and kept swatting at his ear. I shifted my efforts to Short and Wide. He didn’t seem to understand either. I changed tactics. Halloween night, the weather was perfect for me–dark clouds blocking the moon and threatening a stormy evening. Despite the problems it might make for little candy seekers, I had requested those clouds from the Almighty. In the deep darkness, I hovered over the thieves’ target building. At midnight, Bert and his pal arrived. They broke a window in the back of the building. I waited for the yowl of a modern alarm. None came. The abandoned building’s burglar alarm was long gone. I followed the pair to the basement. They unpacked their new hacksaw and other tools. Bert used the saw to bite into the pipes. As the water flowed freely around them, they packed up a load of long copper pipes. I moaned and muttered. My noises unnerved Bert so much he cut his hand. I signaled the Almighty for help. When Burt was just a few steps from the truck, the Lord tossed a lightning bolt that hit and shook the getaway vehicle. Bert dropped the pipes and stared in horror at the fried Chevy Blazer. In a jiffy his pal came running up the stairs. They were both standing in a puddle next to the truck, trying to figure out what to do next when the Lord hurled more lightening down at the ground in front of them. The shock traveled through the water to their feet! Thanks to their shoes’ rubber soles, they were shaken and stirred but not fried. I laughed! They both turned to the sound of my voice and froze in terror, mouths wide open, unable to utter the screams their mouths had formed. They could see me! Another lightning bolt cut though the sky, igniting a fire on the building’s roof. The fire alarms were still working. The keening cry of the fire trucks rent the night. Bert and his friend left the pipes, jumped into the truck, and tried to get their fried engine to turn over. I waved my robes in their headlights. Babbling, the pair threw themselves into the arms of the firemen who pushed them aside. The firemen had a building to save. I heard another siren. The thieves heard it too and started to run. I swirled my robes at them and moaned. A police car careened into the parking area. Handsome and his partner stepped out! They had taken my hint after all. I called up to the Lord, “Please stop the rain so children can collect their candy.” Everything was under control. I floated over to Jenna’s to tell her about it all. After an initial fright, she accepted me. We talked until dawn when I had to resume invisibility. The Almighty asked me if I wanted to retire. I told Him I would not resign until Justice had been served in Claudia’s case. Before the bail bondsman could work his magic to release Bert and pal back to the streets, I visited them in jail. I woke them with a “whoosh” of water from the tiny metal sink. Then I spoke. “Lightening can follow you anywhere and water is not your friend. Confess all your crimes.” The next day they changed their pleas to guilty and added a confession to Claudia’s case. Their lawyer was amazed. I was happy. The Lord, to commemorate my good work, sent a good soaking rain down on the city–at midnight that night.